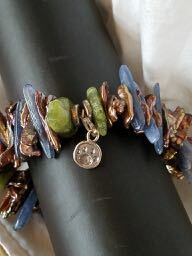 Green Garnet, Kynite and Heshi Pearl, with a Sterling Puppy Paw charm on a lobster clasp. This bracelet is stretchy and the lobster claw gives you the opportunity to switch charms. 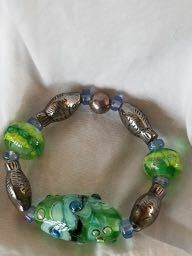 Lampwork and Fish make this a fun little accent for summer. 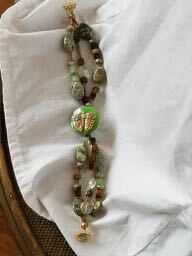 Butterfly button on triple strand of moss agate, tiger eye, rutile quartz and gathered on a gold fill magnetic clasp.